Housed in a building spectacularly engraved with Arabic script, Beit al Quran (House of Quran) showcases a fascinating collection of Quranic manuscripts as well as a library of over 50,000 books written in Arabic, English, and French that center mostly on Islam. Manuscripts dating back to the 7th century as well as Qurans written on parchment, rice, peas, and grains are among the impressive collection. It is claimed to be the only institute in the world devoted to the Quran. The building also houses a mosque, an auditorium, a madrasa (religious school), a museum, and hosts a variety of art exhibitions. 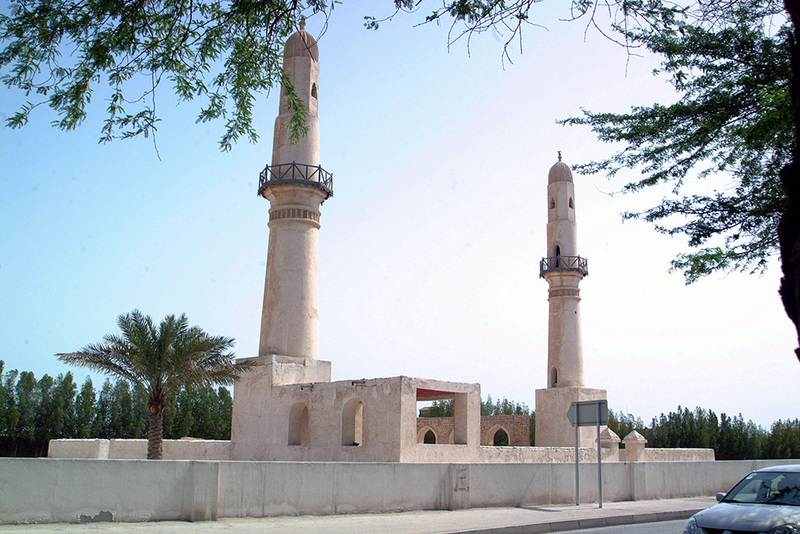 Built around 692 AD, Al Khamis Mosque is one of the oldest mosques in the Arab world. The identical twin minarets on this ancient Islamic monument make it easily recognizable. The foundation dates back to the 11th century and has been rebuilt in the 14th and 15th centuries. During this reconstruction the twin minarets were added. The exquisitely designed Bahrain National Theater is the first national theater in the Kingdom and one its cultural icons. 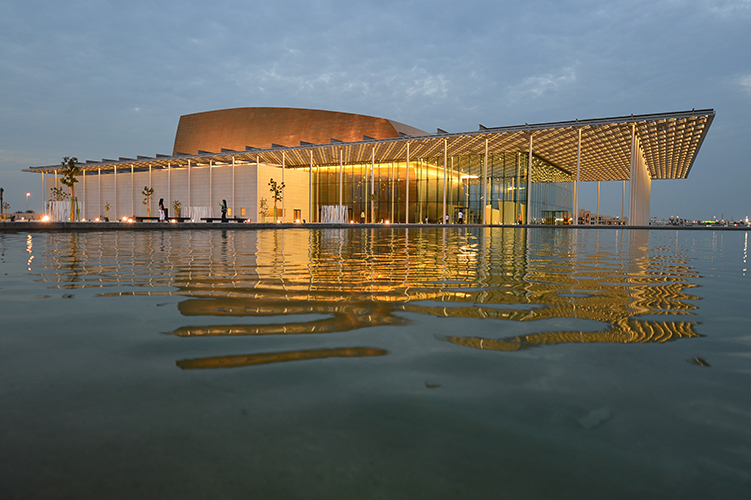 Located between the sea and the Bahrain National Theater lake, the shimmering edifice symbolizes the link between land and sea. It’s intricately woven ceiling is inspired by the ceilings of traditional Bahraini homes, with crisscrossing aluminum strips that allow light and air through. Inside, the auditorium’s modern and delicate curves contrast with its elm-covered walls to resemble pearling dhows. In fact, its entire design draws heavily from the country’s sailing traditions, with a surrounding courtyard that stretches to sea’s edge, making the entire building look as if it is floating on water. Rising from the top of the building is a golden architectural element that illuminates the center of the glass façade. The Bahrain National Theater, the third largest theater in the Arab world, can accommodate 1,001 people; an homage to the tales of 1,001 Arabian Nights. Sprawled over 11,869m2, the theater, in addition to the main auditorium and two balconies, also houses a smaller auditorium that can seat 100 people, as well as a café in front of the sea. The theater is the place to go to watch top global musical and theatrical shows, or just to admire its amazing architectural design. It was built under the patronage of the late Sheikh Isa bin Salman Al Khalifa in 1987 and was named after Ahmed Al Fateh. 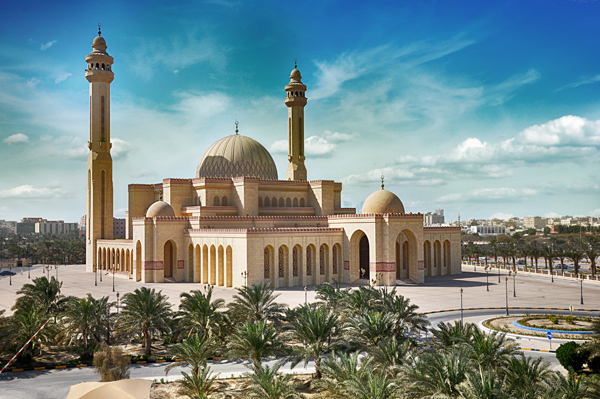 The mosque accommodates up to 7000 worshippers and is crowned with the largest fiberglass dome in the world. 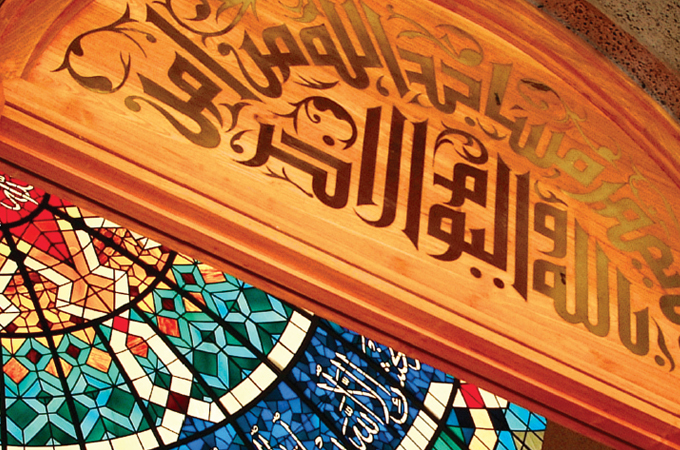 The walls of the mosque are beautifully ornamented with Kufic calligraphy. Bab Al Bahrain is located at the entrance to the Manama Suq in Bahrain’s capital city Manama. Built in 1949, it once housed the government’s administrative offices and overlooked the sea. Bab Al Bahrain has undergone many big changes over the years but the Ministry of Culture undertook a project to preserve it as a cultural landmark and thus restored it to its former glory and eventually moved its tourism sector offices and visitor’s center into the building. Behind Bab Al Bahrain is the old Manama Suq. The suq is a vibrant collection of shops offering a wide range of goods from textiles, spices, incense, perfumes, handicrafts and souvenirs, as well as more modern products from all over the world. There are also a number of traditional coffee shops. The suq offers a unique shopping experience that brings to mind the style of commerce from days long past. 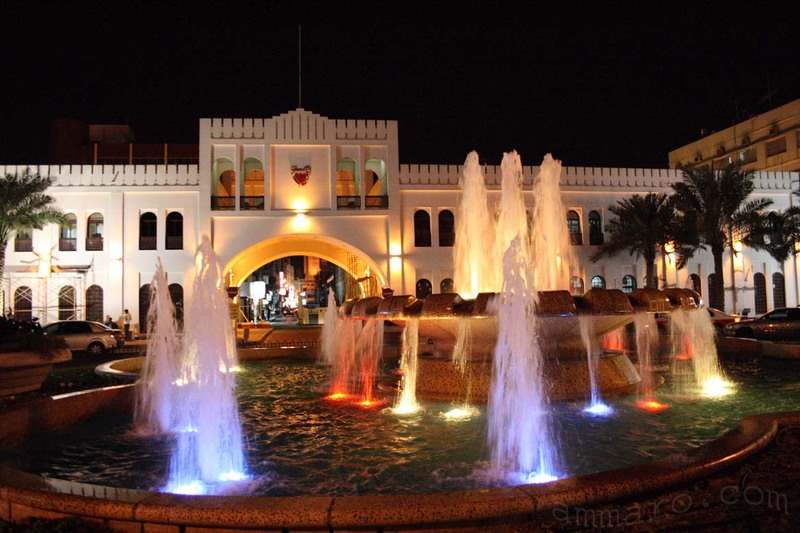 The Manama Suq is a must visit while in Bahrain that visitors will be sure to enjoy. Located in the heart of Adliya, Block 338 is a charming pedestrian quarter crammed with international restaurants, art galleries, and small boutiques. As Bahrain’s hot dining district, Block 338 offers a wide range of cuisine that is sure to appeal to all tastes. Whether you are in the mood for a fancy feast, a more traditional Bahraini dish, or just a soothing drink and a chat, there is something for everyone. In addition to the culinary delights, Block 338 boasts a number of interesting retail opportunities tucked away in the side streets that encourages a stroll around as an opportunity for discovery and has also grown over the years as a vibrant center for emerging artists. It is here that Al Riwaq Gallery exhibits works originating from up and coming artists in Bahrain, the Gulf, and internationally. 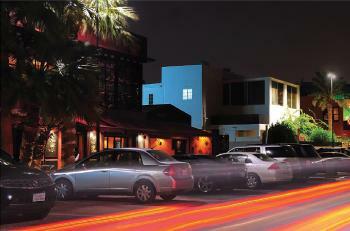 Al Riwaq also has a very popular café in which patrons can enjoy a drink while discussing the latest in the art world. Al Bareh Gallery can be found in the opposite corner of Adliya and is a notable private arts center that hosts exhibitions by leading regional artists. A diverse program of exhibitions runs throughout the year in the gallery while an adjoining space is devoted to a non-profit initiative, ABCAD (Al Bareh Center for Art, Design, and Visual Culture). Devoted to artistic experimentation, ABCAD breaks art out of its human confines through work-shops, design focused film nights, and an outdoor graffiti wall. There is also a café with outdoor and indoor seating. Known as Dilmun in ancient times, Bahrain’s rich trading history is reflected in numerous archaeological digs around the island. 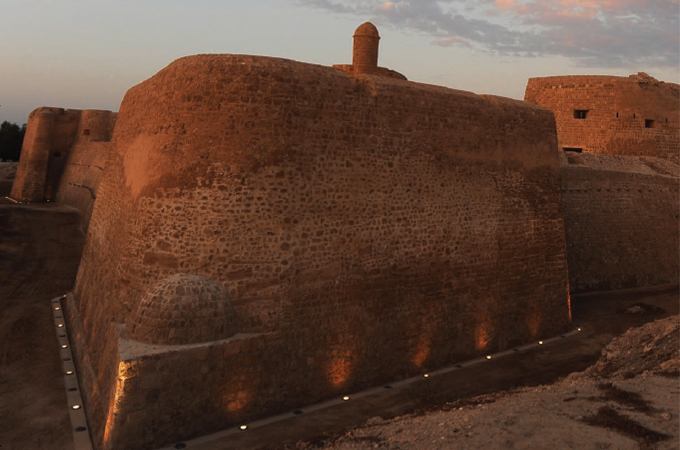 Qalat al-Bahrain site (Bahrain Fort site) is among the most exciting of them and is registered as a UNESCO World Heritage Site. The fort is located atop a 17.5 hectare artificial hill that has been built while enduring over 4,000 years of continuous occupation. It is also the site of the former capital of Dilmun and is one of the most prolific archaeological digs in the Arabian Gulf. Excavations over the past 50 years have revealed residential, public, commercial, and military structures that testify to the importance of that location over the centuries. Open to the public since 2008, the site museum display area consists of 5 exhibition halls organized around the massive Tell Wall with over 500 artifacts showcased and many interesting layers of its historical legacy have been revealed which is further highlighted with the use of an audio guide available to visitors. Additionally, a seaside café offers a stunning view of the fort and the surrounding palm groves. 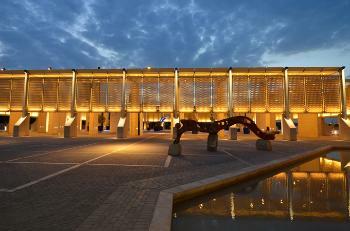 One of the first museums in the Gulf, the Bahrain National Museum opened in 1988. The site itself, on the edge of the sea, is a tremendous attraction, adding to its contemporary ambience which is influenced by the white travertine façade and dramatic courtyard decorated with contemporary sculptures. The exhibition halls showcase artefacts uncovered in the numerous archaeological sites in Bahrain and underpinning the longstanding history of the island. The rich collection covers 6000 years of Bahrain’s history. In addition to the archaeological exhibits, two halls are dedicated to local customs and traditions, featuring clothing, housing, rituals and traditional crafts. Moreover, the art hall features a permanent collection of works by some of Bahrain’s leading artists as well as regularly hosting temporary exhibitions. Adjacent to the National Museum can be seen the Art Centre and Cultural Hall, both of which host temporary exhibitions and concerts throughout the year. A new addition to this cultural compound is the recently inaugurated Arab Regional Centre for World Heritage.